Craving authentic Bihari Kababs and Nihari? Patna Kabab is the place to go! We have tried many different Indian/Pakistani restaurants, but have always returned disappointed. However, when it comes to the aforementioned items, Patna Kabab has got them down pat! They have patrons travelling all the way from Mississauga (older sister) to Scarborough (younger sister) for their food. Here’s a link to their menu: Patna Kabab House Menu. On our most recent trip to Patna we ordered these very items for our Saturday afternoon lunch. Their Nihari ($5.99) has the same slow-cooked taste as the Nihari from a small dhaba in Pakistan. The meat is very tender and they are quite generous with their botis. The level of spice is perfect; it’s neither bland nor super spicy. It comes garnished with julienne garlic, coriander and a piece of lemon. Nihari as good as Patna’s should only be eaten with hot and fresh Naan from the tandoor. The Naan are $1.25 each but completely worth it. We also ordered their Bihari Kabab ($6.99) plate which consisted of small pieces of beef on a hot plate garnished with onions. The younger sister is a not a huge fan of kababs but even she enjoyed them! Nihari & Bihari Kabab with Naan. We have tried a few other dishes, but have found these two dishes to be the best. Our mom loves their Nihari so much that whenever she passes by Patna she always gets two orders of Nihari for take-out. We strongly feel that the decor of the restaurant does not match their great food. The decor is strictly average: it’s just a bunch of tables and chairs. It’s a fairly clean place but it’s not squeaky clean. If only this place spent some money on making the restaurant look half-decent we’d be all praises. The service is pretty quick and it’s also mainly self-serve. Saying that I would like to mention that this place does good business despite their shortcomings in the overall ambience of the restaurant. In case you’re visiting them in the evening, make sure you have reservations, as this place gets packed in the evenings. So if you’re looking for great Nihari and & Bihari Kababs then make sure you try Patna Kabab House. Categories: Restaurant Reviews | Tags: Bihari Kabab, Halal, Halal Restaurant, Naan, Nihari, Pakistani Cuisine, Patna Kabab House | Permalink. 40 minutes before iftaar: Friend does a Facebook check-in at Sheriff Broaster Chicken. Thoughts running through my mind: I have passed by this place a dozen of times now and I was waiting to try it after Ramadan but..AHH! So hungry…broast chicken..deep fried goodness…must..TRY! 5 minutes later: Rushes out the door, mumbles some random explanation to my mom, starts car and out we go! On the way there, I texted my friend from the car to find out what she had ordered. 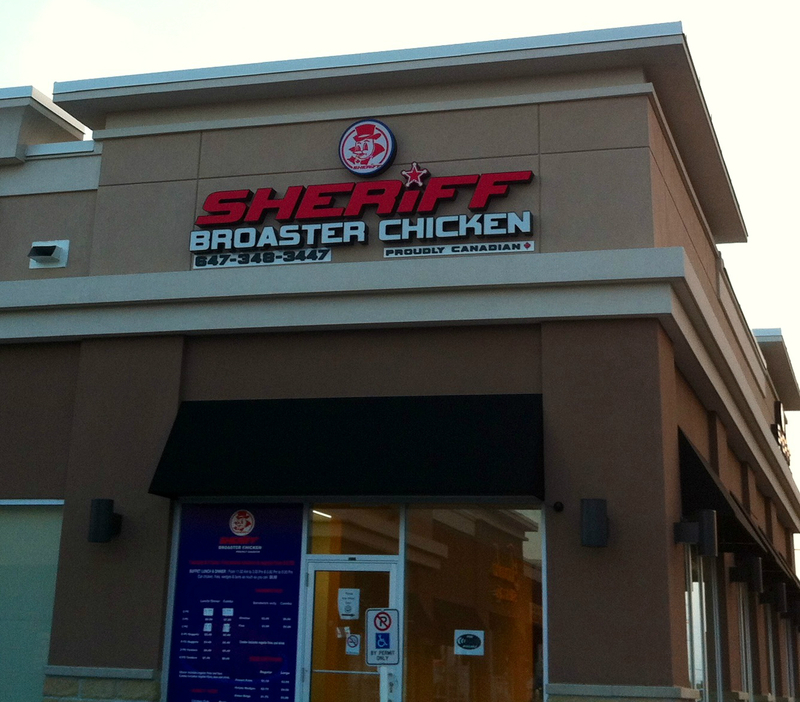 30 minutes before iftaar: Arrives at Sheriff Broaster Chicken. Doesn’t bother looking at the menu and ordered the same thing as my friend: two piece chicken special. One order or two? What will mom say? Does mom want to eat this? I didn’t even ask her! Ahhh! Umm okay, make it two orders. But wait, what if it’s not good? I will never hear the end of it from my mom. She’s always telling us how we waste so much money on trying new restaurants. No time. Make it two orders! 10 minutes later: Food is ready. I get it packed and run out the door. Arrive home 5 minutes before iftaar: I had a hard time answering my mom’s questions over the delicious smell of the chicken. Iftaar time: Scared to try the first bite. Bismillah. *Puts a piece into mouth*. What the …this stuff is actually good! The chicken had a nice kick to it. When they said spicy, they meant spicy. Dips chicken in garlic sauce and ketchup. Yum!! Even my mom liked it. Now that is HUGE! Surprisingly and to our pleasure, the food was very good. The chicken was deep-fried to perfection and it wasn’t very greasy either. Meaning that it didn’t put us to sleep. Usually after eating Popeyes we both have a sudden urge to take a nap. Not this time and with this chicken. 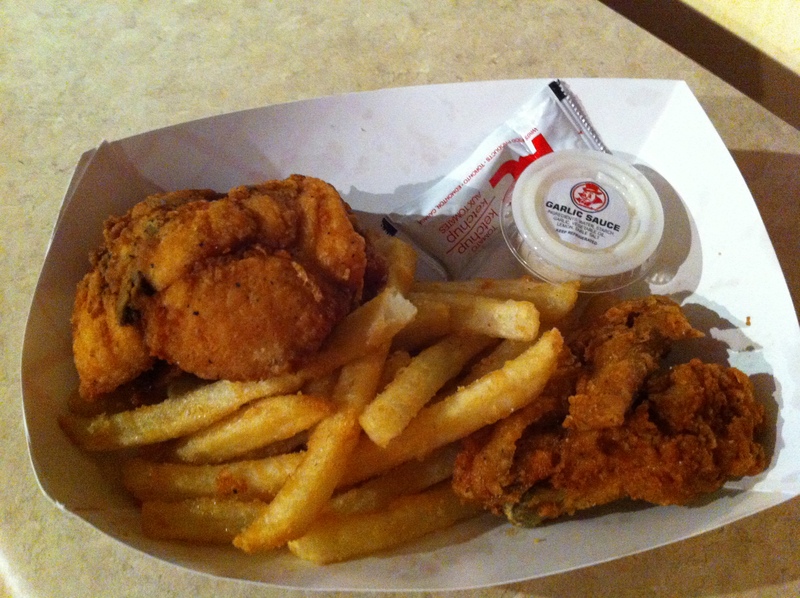 The two piece chicken special came with fries and lots of garlic sauce. 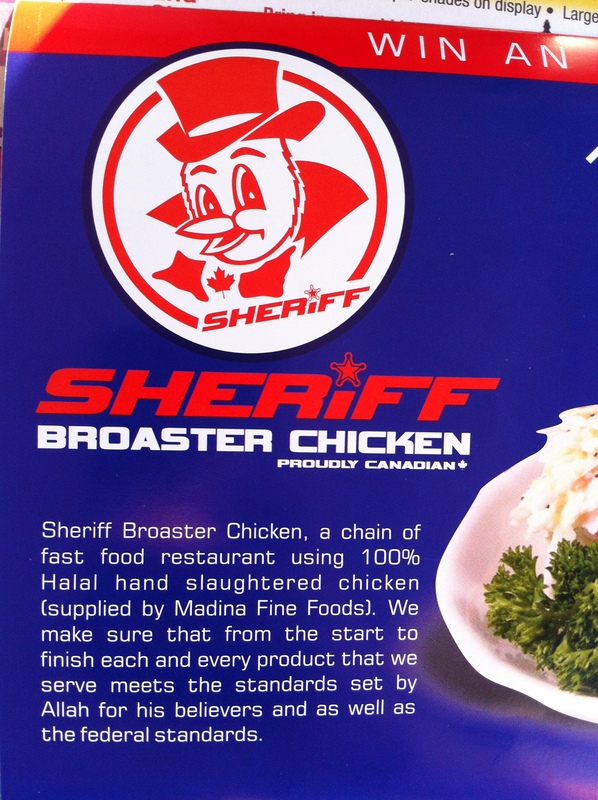 Here’s a link to their menu: Sheriff Broaster Chicken Menu. On our second visit we tried their chicken sandwich. We asked for spicy and boy, was it spicy! There were three of us that went that day and we all LOVED the sandwich. The owner insisted that we try the fish sandwich as that’s their best item but we passed on that. Since I’ve always been a fan of chicken sandwiches, I would certainly go for it on my next visit as well. Apparently when my sister tried their fries, they were good and unique; however, when I visited, it were the spicy ‘Popeyes’ fries. Potato wedges were fine too. Their seasoning is the key to their delicious chicken. It’s literally finger licking good (sorry KFC). The best thing about this place is that it’s super duper clean. You can peek into the kitchen from the front counter and you can see all the squeaky clean equipment. My only hope is that they continue to keep the place that way because most desi run places fall short in this area. Will I be returning to this place? Yes! (I am actually going again today. Shhh!). The two times that I have there I have heard the customers there praising their food and rightfully so! One customer was saying they live quite far from this place but drive down just for their chicken. Categories: Restaurant Reviews | Tags: Broast, Chicken, Deep-fried, Halal, Halal Restaurant, North American Food | Permalink. This establishment has closed down. 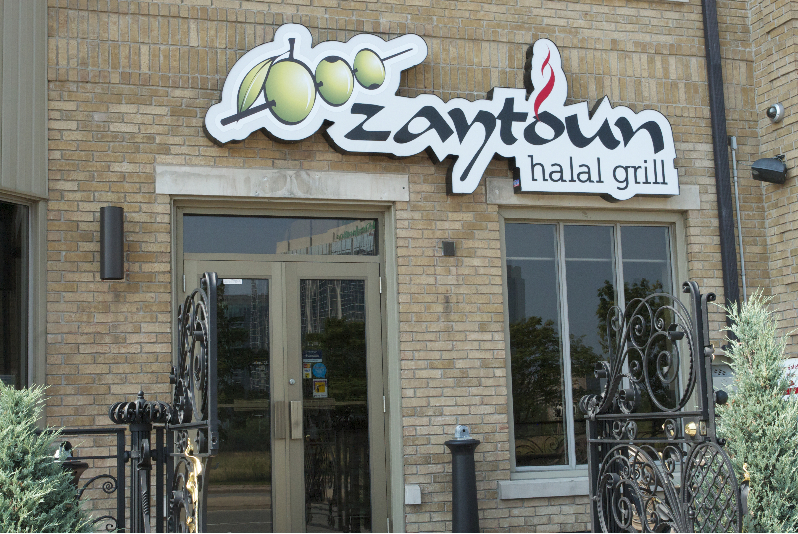 Entrance of Zaytoun Halal Grill. Picture from the restaurant’s website. 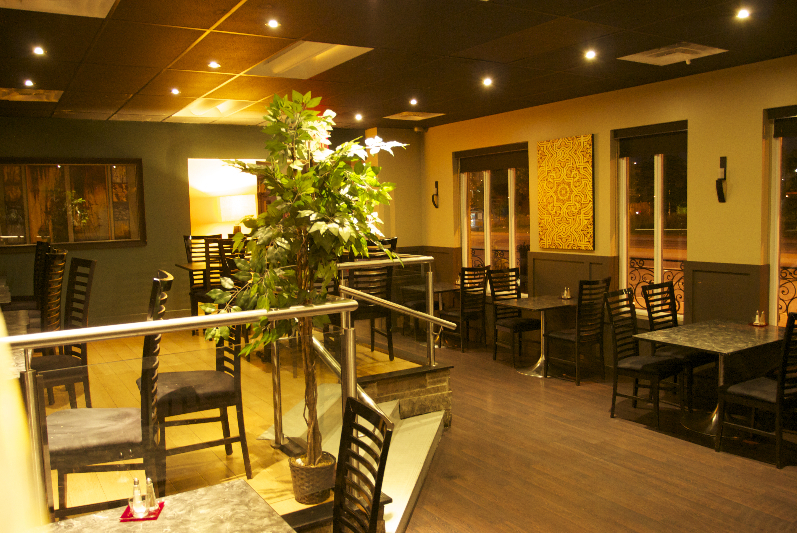 Formerly known as JFK Lounge, Zaytoun Halal Grill is located near Square One, Mississauga. We first saw their ad on Facebook and visited their page. From the pictures the place looked promising and the menu was quite tempting as well. Anxious to try the place and wanting to check off one more restaurant from our must-try-restaurants-list we visited this place recently on a weekday evening. As we walked in the door we were pleasantly surprised that the pictures from their page did justice to the place. The walls were decorated with abstract art pieces, the hardwood floors were well-maintained and clean (and shiny! ), and there were a couple dozen pot lights to create the right ambiance. Right off the bat we were impressed with the place as we were able to check a couple of things off our list. Inside the restaurant. Picture from the restaurant’s website. Their menu is fairly diverse, yet not excessive; providing their patrons with plenty to choose from. 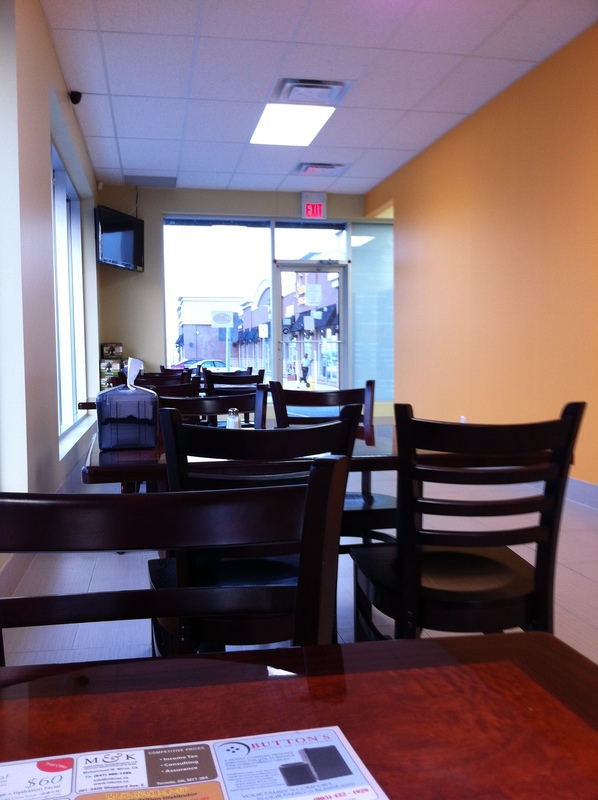 Here’s a link to their menu: Zaytoun Halal Grill Menu. For appetizer we ordered the Chicken Quessadilla ($8.95). 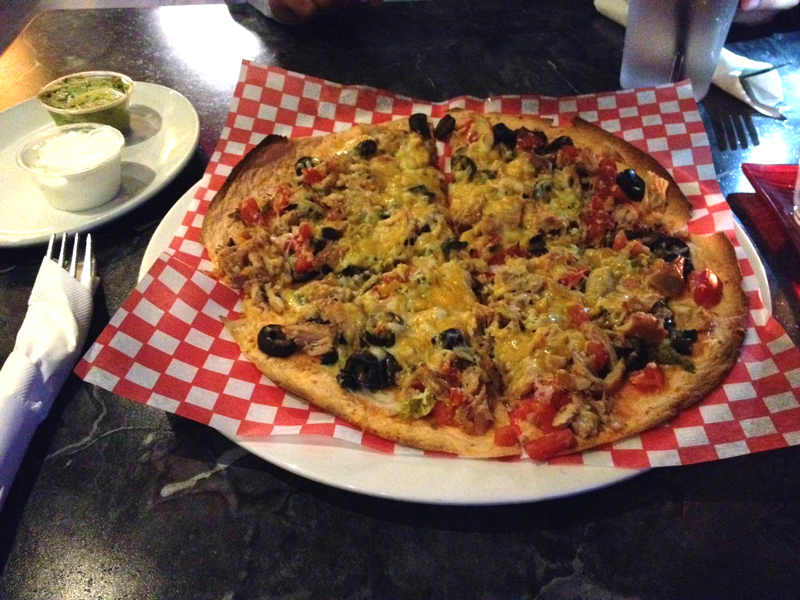 It was a soft tomato tortilla topped with chicken, fresh tomatoes, black olives (mmm! ), jalapeño peppers for a kick, and cheese that was melted to perfection all served with sour cream and guacamole on the side. Served hot with cheese oozing out, this dish was the perfect way to start our meal and we devoured all of it within minutes. For entree we ordered the Grilled Chicken Sandwich ($9.95) and the Philly Cheese Steak Sandwich ($11.95). 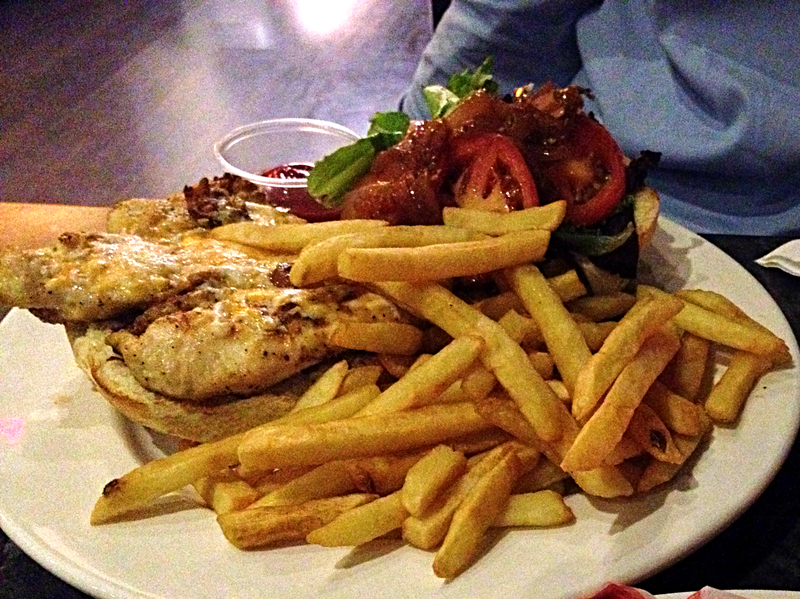 The Grilled Chicken Sandwich had grilled chicken topped with tomatoes, greens, cheese and mustard between two pieces of toasted buns and served with fries. It was a decent sandwich and it definitely filling. 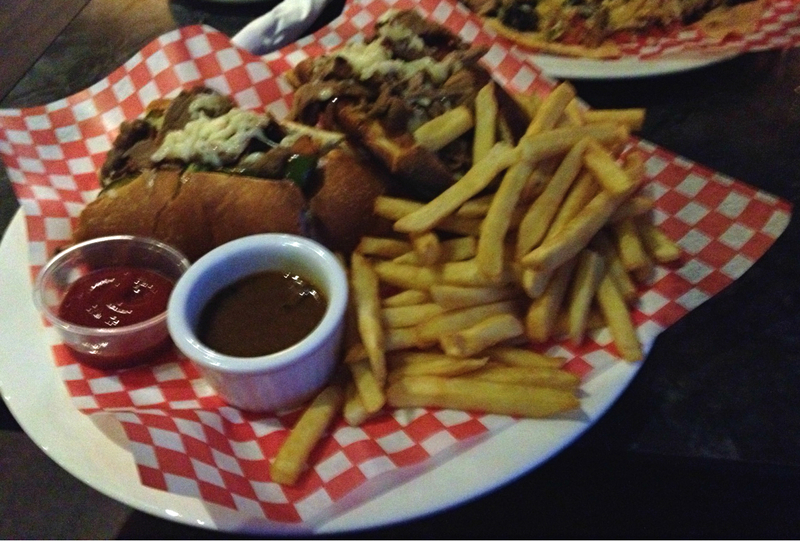 The Philly Cheese Steak Sandwich had good amount of steak with caramelized onions and cheese. It was good; however, we thought they could’ve added more cheese and seasoning to the meat. The host/manager/owner was very nice and asked for our feedback, which was well received. We will say though that the cherry on top was that they have a very nice prayer area. 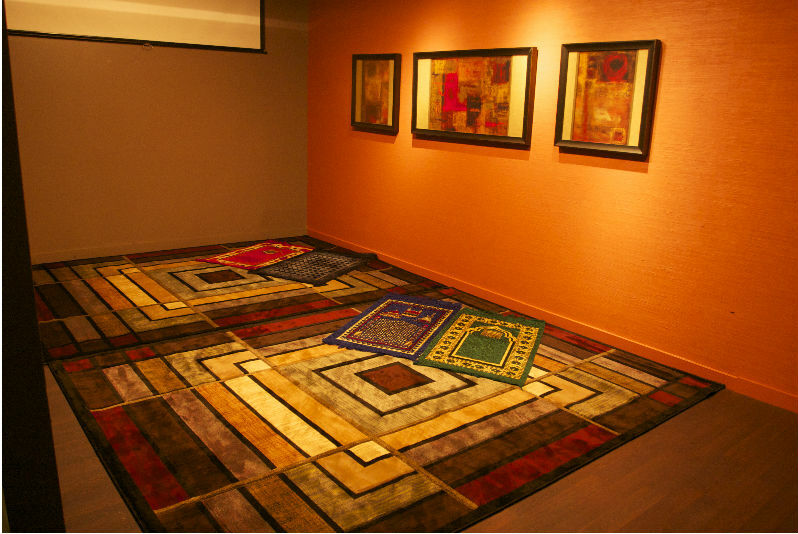 Any halal restaurant that offers a prayer area is a winner in our books and for that they get a double check √ √. 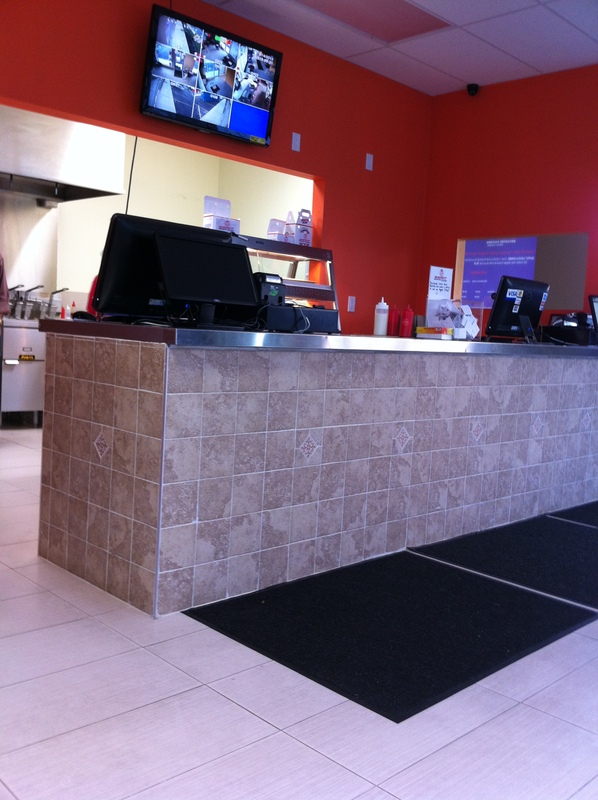 Furthermore, the service was excellent and our server was very friendly. Service is another thing that makes or breaks the deal for us and I can gladly say that Zaytoun Grill passes this with flying colours (mashallah!). Beautiful prayer area. Picture from the restaurant’s website. Since we were stuffed from our meals we did not check the desserts menu which is a bummer because we are big dessert people. We will definitely be returning to this place to try other items on their menu inshallah. I am particularly looking forward to trying the pastas, the items under the “Classics” category and their desserts. Categories: Restaurant Reviews | Tags: Halal, Halal Restaurant, North American Food, Zaytoun Halal Grill | Permalink.